Pecan pie is a staple in most homes during the holidays. While July is normally the best month for peaches, Spoetzl Brewing in Shiner, TX (home of Shiner Bock) has decided to bring peaches to us during the Autumn and Winter seasons and has truly outdone themselves. 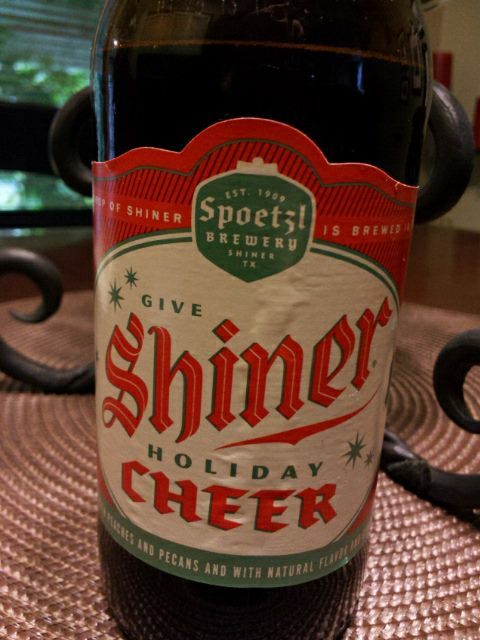 Shiner Holiday Cheer is a deliciously great way to celebrate family, home, caring, sharing, warmth, and love. OK, that might be a bit too sappy. It’s a great beer to enjoy during your holiday meal. Holiday Cheer is an Old World Dunkelweizen brewed with Texas peaches and roasted pecans. The aroma is heavenly with swirls of fresh peaches and cinnamon. The taste…like drinking a peach and pecan pie! In fact, (as the Cajun side of my family would say) it’s so good it will make you wanna go home a slap your mama! The finish is a lovely symphony fresh peaches! Peach sweetness from start to finish without being overpowering. Matly, fresh, awesome! Holiday Cheer would go great with your thanksgiving Turkey, Christmas ham, or as an after dinner dessert. It’s available now in your local bottle shop so grab some before the season ends!